Tuesday January 6- 1931 I was busy with different things in forenoon a letter from Louie Bremner. Wrote Ida after dinner I did some ironing after dinner. Mary came and took me to Mrs Webbs to return a book. I wrote LeGrand & Clara Robinson in the evening Wednesday January 7- 1931 Did the morning work. Mary came and took me to The Church. Hattie was there till lunch time I had Ott Mary & Buddy take lunch with me. Mrs Miller brought me home after the PM meeting. I had not slept well last night. I lay down till supper time I had a letter from she that was Maggie McKee when I taught near Delavan in 1895. Read in the evening Thursday January 8th 1931 I did the regular morning work. a letter from Millie Byington & Winnie. Rob took me up to Mrs Raymonds at noon to The Red Luncheon. Later had a ride with The Wests when they brought me home. Read all evening. Friday January 9- 1931 Busy about the house all AM. Mary took me up town after dinner. Did errands. Walked home. slept awhile and wrote Mrs Falk. 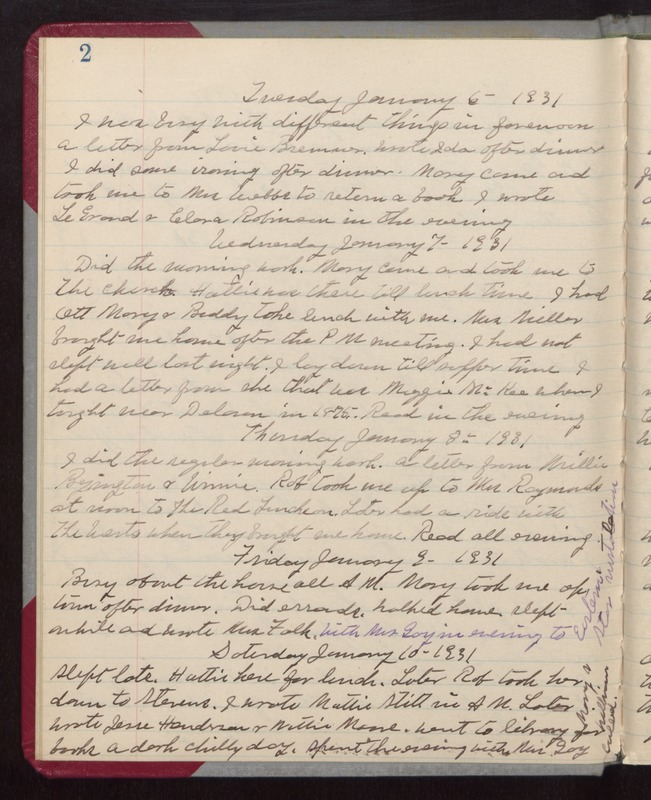 With Mrs Gay in evening to Eastern Star [instalation] Saturday January 10- 1931 Slept late. Hattie here for lunch. Later Rob took her down to Stevens. I wrote Mattie Stitt in AM. Later wrote Jesse Henderson & [Nettie?] Moore. Went to library for books A dark chilly day. Spent the evening with Mrs Gay Mary & William called.